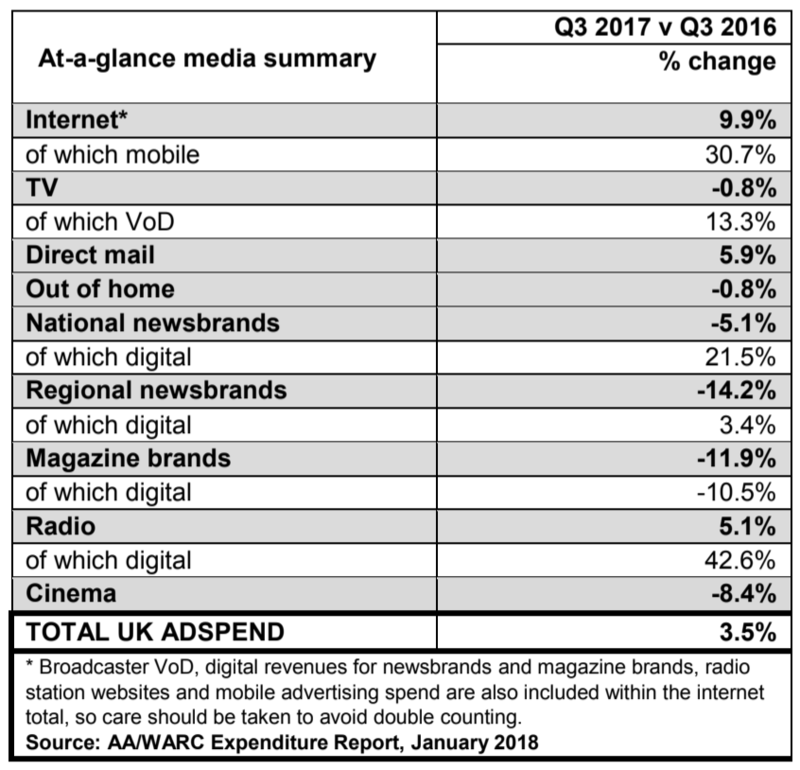 UK advertising spend in Q3 2017 rose 3.5% year-on-year to reach £5.4bn – the 17th consecutive quarter of market growth, according to Advertising Association/WARC Expenditure Report data published Wednesday (31st January). The latest data underpins preliminary figures, which show 2017 spending grew to £22.1bn – representing the eighth consecutive year of market growth. 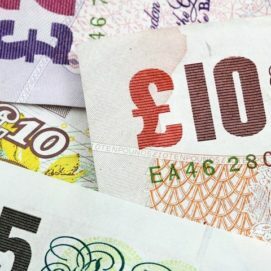 – Total UK ad spend over the first nine months of 2017 was 3.5% (£551m) higher than the previous year. – The preliminary estimate for 2017 growth is 3.4% (to £22.1bn), an upgrade of 0.3 points since October’s forecast. – The projection for total market growth in 2018 is 2.8% (to £22.7bn). – Mobile ad spend rose 30.7% year-on-year, buoyed by a 44.7% rise in social media advertising. Ad spend growth was up 9.9% year-on-year within internet as a whole, inclusive of digital revenues for news brands, magazine brands, TV, and radio broadcasters. Year-on-year numbers were up 21.5% in Q3 2017 for national news brands, an impressive 42.6% for radio, and 13.3% for broadcaster video-on-demand. Gary Danks, co-founder and MD, Machine, says that “it’s incredible to see the heights mobile has reached, compared to when I first started evangelising about the channel a little over a decade ago. Mobile clearly works for brand and performance advertisers. My concern now is that we maintain the integrity of this media channel. At Machine, of the more than four million app installs we managed for our clients in January 2018, we disputed over 52% due to app install fraud. This is a situation the entire industry has to urgently address, to ensure we see continued positive growth and trust in mobile by advertisers”. Jodie Stranger, CEO UK group and president global clients EMEA, Starcom, asks if we have arrived at the year of mobile: “With the projection for total market growth in 2018 being 2.8%, we’re excited for the year ahead for our clients. This growth shows consumers remain confident in brand’s marketing, even during economic ambiguity. Evangelos Sideras, joint MD, UK, Media iQ, highlights the report shows the importance of social. He says “it’s clear to see the impact social media advertising is having, which we expect will drive advertisers to invest in businesses that can convert insights extracted from data and deliver high-performing digital advertising campaigns. This is an exciting time for technology companies, as we are able to show how we can utilise data that can ultimately influence and shape marketing strategies. “These results show a lacklustre increase across display, which is understandable given it has been a year plagued by transparency issues”, according to Julia Smith, director of communication, EMEA, Impact Radius. She goes on to say that “the upside, however, is the strength in market which mobile has shown. These figures highlight the way in which mobile is fast becoming the sector of growth, spend, and innovation. However, there is a black cloud potentially hanging over this positive news, as the fraudsters go where the money is and mobile is attracting the unwanted attention of install app farms, proxy spoofing, and device hijacking. Mobile advertising will need to quickly ensure that they have robust tools and measures in place if they are going to thwart this threat”. Although display is suffering, Stuart Taylor, CEO of Western Europe, Kinetic, feels that OOH is thriving: “While conditions were challenging in the third quarter, these latest UK ad spend figures point to the continued robust performance and overall growth of the Out-of-Home sector in 2017. This reaffirms the confidence UK advertisers place in the medium as a trusted and reliable channel for reaching consumers and creating impact at scale. “As in previous quarters, innovation and investment in digital Out-of-Home (DOOH) remains the key driver of spend and growth in the sector. Alongside new and improved digital formats, OOH is also drawing on cutting-edge technologies to open up opportunities to reach outdoor audiences in creative new ways, from experiential installations using Virtual Reality to Lightvert’s pioneering ECHO technology, which saw its commercial debut in the final quarter of the year. Simon Kilby, Group Commercial Director, Bauer Media, notes the impressive performance of audio. He says “it’s exciting to see the impressive growth of radio, most specifically digital, over the last year. Dynamic creative and personalisation in digital audio advertising has been effective in driving higher brand engagement by using different types of data: including day/time, location, name, gender, age, weather and consumer interests. This targeted digital audio advertising makes for a much better listener experience and creates a more premium environment for the advertiser”. Greg Grimmer, chief operating officer, Fetch outlines the perils of making predictions in an unpredictable year. He says “a year of politico-economic nervousness and soaring stock markets was always going to be a tricky one to predict advertising expenditure. Any media fool (and there are plenty) could have predicted the continued fast growth of mobile. Perhaps less easy to predict is the longer term effect of the brand safety/tracking backlash aimed at the dynamic duo of Google and Facebook. I personally think any effect will be negligible and outweighed by more positive factors of marketing success. But the report does continue to highlight the fact that digital ad expenditure will benefit broadcaster and publisher brands, as well as the digital pure play”. Amit Dar, strategic partnerships lead, Taptica says “2017 was a challenging year: political upheaval, issues with brand safety across social networks, and economic slowdown, so it’s encouraging to see another rise in UK ad-spend – the 17th consecutive quarter seeing growth – in spite of this. I feel optimistic about the year ahead, with new data legislation like GDPR promising to level the playing field, pushing brands and advertisers to collaborate, experiment with more creative formats and improve viewability”.